King has always lived his life the way he saw fit and didn’t care what anyone thought. Women were just a passing hobby to waste time and warm his bed. Being the VP of the Soldiers of Wrath Grit Chapter meant he had other responsibilities and priorities besides taking up with an old lady. But then Clara came into town and something shifted in him. For the first time in his life he felt possessive and territorial of a female. It felt damn good, but it also messed with his head, especially when she claims to want nothing more from him aside from the monster he’s packing behind his fly. Clara won’t ever settle down, and no man will ever own her. 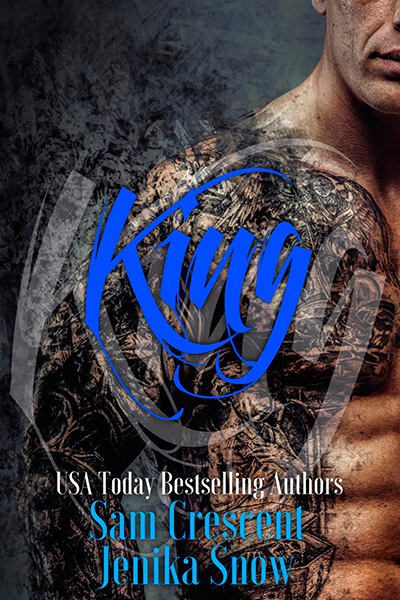 Visiting a friend in Grit, she discovers King, a man who refuses to back down. All she wants is to have some fun and to save enough money to move onto the next town, the next adventure. Every time she tries to get away, King is there, giving her a reason to stay. What will she do when King makes her realize she’s falling in love? Can she trust him with her heart? What happens when she does try to run?